the theatre she was fond of but in those days it was an object of something like worthy interest. ... I have enjoyed many a play with her! Jonathan Bell at 82 years of age reminiscing about his sister, Priscilla. History of the Saving Bank. I speak of her charity - her whole life was a devotion of benevolence! Furthermore Tottenham at this time was particularly attractive to wealthy families with it’s clean air and water and good educational facilities. BG Windus, Rowland Hill in Bruce Grove and William Hobson in South Tottenham. Quakers were one of the groups of Dissenters, or Christians, who withdrew from the Church of England and founded their own places of worship. They opposed state interference in religious matters, schools and communities and were persecuted and often imprisoned or fined for their dissenting views. 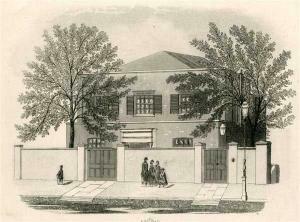 The Quakers were one of the non-conformist grousp which settled in Tottenham. Dissenters were particularly attracted to Tottenham as it was outside of the City of London – an important consideration as The Five Mile Act (1665) was still in place. This prevented nonconformist ministers from coming within five miles of any corporation that returned members of parliament, or any parish where they had been the minister or preached. Religious dissenters faced widespread prejudice in Britain. The friendly spirit of usefulness and social service that characterizes Quaker thinking is evident in Priscilla Wakefield's philathropic work and in her writing; she had a strong sense of order and purpose in society. She was a lifelong Quaker but she disagreed with some Quaker habits of dress and behaviour. She did not observe Quaker restrictions regarding dress and abstinence from amusements - she loved the theatre, music and dancing. The Religious Society of Friends, often referred to as Quakers or Friends, were one non-conformist group which settled in Tottenham. Members of the various Quaker movements are all generally united in a belief in the ability of each human being to experientially access "the light within", or "that of God in every person". 1 February 1798: Yesterday completed my 47th year - the thought should stimulate me to give greater diligence in the great business of my existence. How much is there to do and how little time to do it in! I hope they will continue to procure a reputation as well as profit. Mrs. Wakefeild [sic] did me a very signal service on my first coming to London—by giving me a letter of recommendation to Mr Farington. Luke Howard the Namer of Clouds, is commemorated with the only English Heritage Blue Plaque in Tottenham. He is also known as the Father of meteorology for his detailed observations over many years of the weather and cloud formations. Luke Howard was an active Quaker involved in social justice campaigns including the Anti-Slavery movement, Society Against Capital Punishment, Society Against Cruelty to Animals and a founding member of the African Institution. Johann Wolfgang von Goethe was an admirer of Luke Howard's system of categorising clouds and wrote a poem In honour of Mr Howard. For more information on Luke Howard visit Tottenham Clouds. 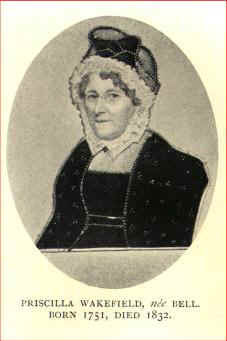 In her private character, whether as a daughter, wife, mother, or grand-mother, Mrs. Wakefield was exemplary; in her disposition, remarkably calm and cheerful, bearing with great patience an accumulation of extreme bodily suffering : indeed, her whole conduct discovered an energy, philosophy, meekness, and resignation, rarely to be met with.